Just as a journey of a thousand miles begins with a single step, a journey of a real pimp begins with a normal snack. 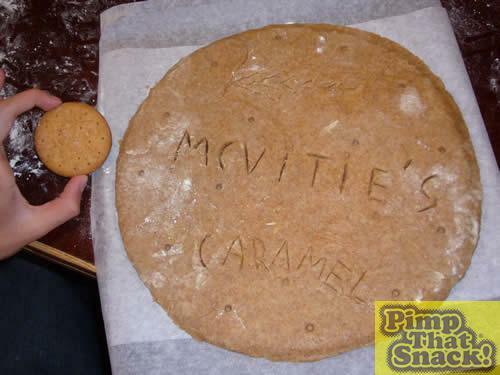 This one began with the favourite biscuit of my friends and me: the McVitie's Caramel Digestive! Surely, until this pimp, no lovelier biscuit had been made? While some people may celebrate the end of their long and gruelling exam period by going out and getting pissed, we decided that 11 in the morning wasn't a suitable time for excessive alcohol, and so attempted a grand project instead; the pimpin' bikkit! The biscuit, handily, is made of 3 separate layers: the bikkit, the caramel and the chocolate. Before grabbing any cooking implements, we first had to have a plan. The chocolate was going to be easy to do, for the caramel we decided to melt (like chocolate) Werther's Chewy Toffees, (though actually these toffees were a bit hard – if anyone wants to attempt this pimp, we recommend using some slightly softer toffees). 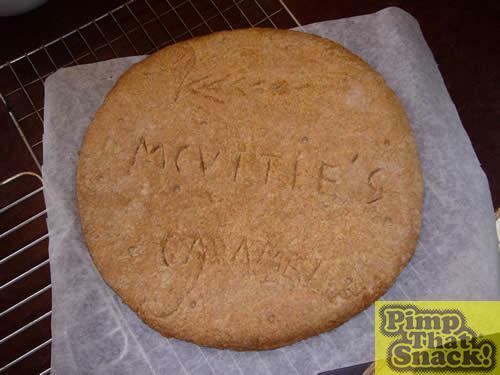 For the digestive biscuit base, although we toyed with the idea of using crushed up digestives, we thought it best to bake a proper biscuit base. Therefore, armed with a recipe, some money, and a braincell between the three of us, we headed with all alacrity to the nearest Tesco! We also used a teaspoon of baking powder, but stole that from our kitchen, as well as a Bon Jovi CD, Red Hot Chilli Peppers CD and a Keane CD for some background music. 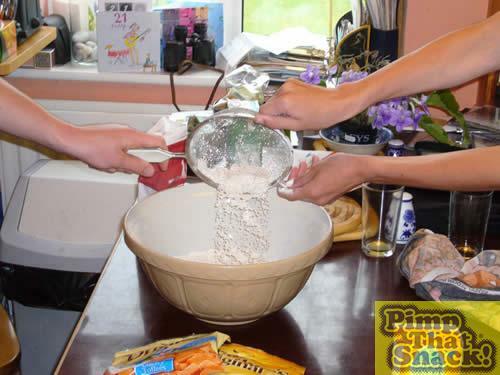 Having added the sugar and butter, we then rubbed it into breadcrumb-like consistency. You know what they say, 4 hands are better than 2. We added 3 small eggs, and then mixed it all together, but found it wasn't quite sticky enough. 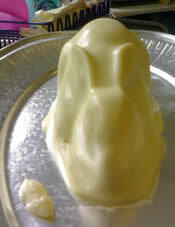 This required some on-the-spot thinking, and we ended up adding half an egg, to get it to the right stickiness. If we'd been organised we would have fried the remaining half to eat, but weren't, and just binned it. 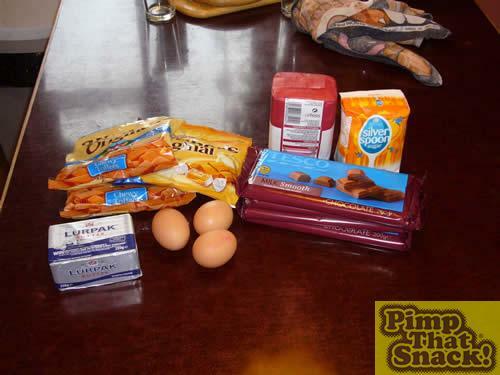 Anyway, after mixing it all up, we prepared to roll it! 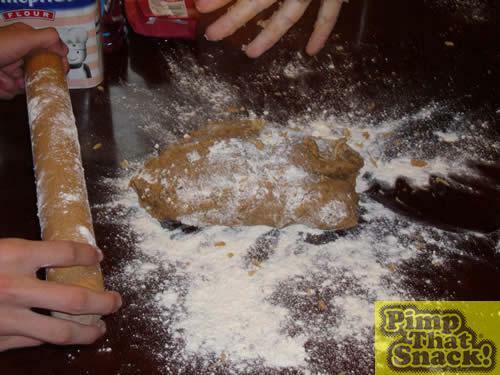 We then rolled it out to about ¾ of an inch in thickness, amazingly without getting it stuck to the rolling pin! 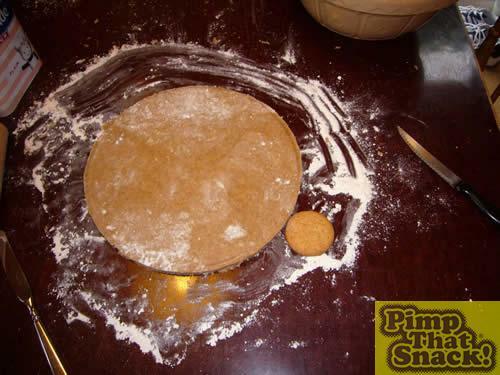 To get a circle, we took the largest bowl we could find, and placed it upside down on the rolled-out dough, and cut around it. Then we faced a problem; how to transfer this overgrown monstrosity (I use the word in the nicest possible sense) from the table to the baking tray, without damaging the shape? At first we tried to slide the tray underneath the biscuit…but this wasn't possible, as we realised that once on the tray, it didn't slide too well. In the end, we just had to lift the whole thing, but thankfully, it stayed together. Hurrah! 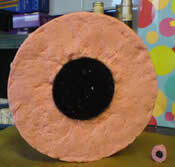 Next, our expert artist demonstrated his prowess, by crafting the design of the original biscuit, onto our recreation. The holes were made with a chopstick, and the writing and design with a knife (using both ends). Then, into the oven (at 180°C), for… a while. The recipe said 12-15 minutes, but that was for considerably smaller digestive biscuits. We just kept on looking at and prodding ours. It was done… eventually. However, I think it turned out a success, despite the long baking time.